We introduced a new required course "EnSc 210: Issues in Environmental Science" for our majors about three years ago. When I was assigned to teach this course for the first time, I struggled with developing a syllabus and recommending a text for the course. 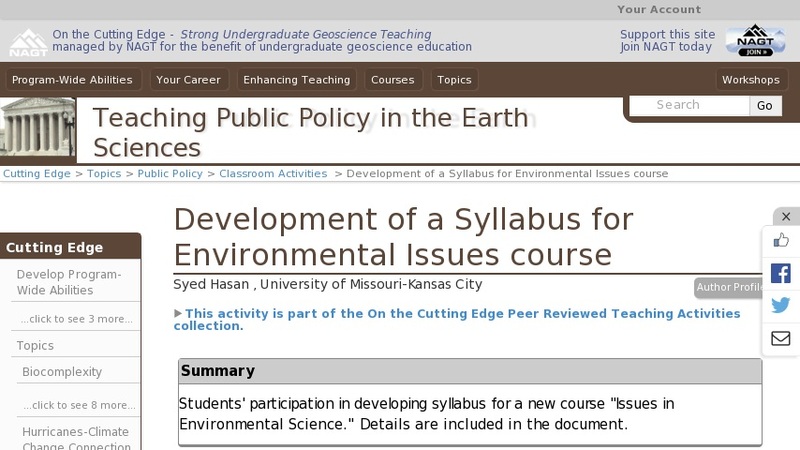 Since we also offer classes in "Environmental Geology" and an introductory course "EnSc 110 Understanding the Earth," the challenge was to avoid duplication while developing an appropriate syllabus. What I finally decided to do was to have students provide ideas. So, on the first day of class I announced that we don't have a syllabus for this course (many sighs of disappointment) and, after a brief remark on some current environmental issues, invited each student to suggest at least one topic for inclusion in the course. After some hesitation (as expected) hands went up and I began writing each topic on the white board. Pretty soon we had 20-25 topics with some overlapping themes. Some of these included: population problem, global climate change, air and water pollution, waste management, environmental health, species decline, environmental impact of large dams, and sustainability. After some discussions about relative importance of various topics and the time available to cover each during the semester, we narrowed it down to about 10 topics for detailed study. I prepared my syllabus (linked below) based on this list which worked very well because: we were able to include key topics and, very importantly, students felt a sense of 'ownership' which led to a very interesting and interactive class experience throughout the semester.